The torchbearer of a new generation of Chinese players, Ding Liren remains something of a mystery. On the eve of his 15th birthday, when many young prodigies have already become grandmasters, he was still rated below 2300 and appeared to have played only a handful of rated games in the previous years. 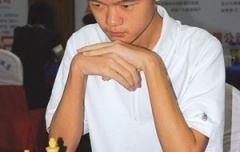 Then he achieved lift-off, and in 2009 he spectacularly won the adult Chinese Championship as an untitled 16-year-old. The favourite Wang Hao had been leading by 1.5 points with only two rounds to go, but lost first to his young rival and then to one of the bottom-placed players. Ding Liren also got some help with a forfeit win when his last-round opponent failed to turn up on time, but any suspicions the victory was unmerited disappeared when he went on to win the Chinese Championship again in 2011 and 2012. Ding Liren’s combined score in those events was an incredible 18 wins, 15 draws and 0 losses. Successful performances for the Chinese team also helped to confirm both his rating and his standing as one of the world’s top juniors – in 2012 only Fabiano Caruana and Anish Giri were ranked above him. Ding Liren almost achieved his first major international success in Biel 2013, but in the final round he lost to Maxime Vachier-Lagrave when he only needed a draw. He was still tied for first place but lost again to the same player (and eventual tournament winner) in the 4-player play-off.